Baritone guitars are not quite basses and not quite guitars, and that makes them one of the most misunderstood instruments out there. Guitar players don't know what to do in such a low tuning, and bassists are confused by those two extra strings. I think this is a shame--after all, you can do a lot of really amazing things with a baritone--and so do our friends at Reverend. So, they sought to design a baritone that everyone would want to play. 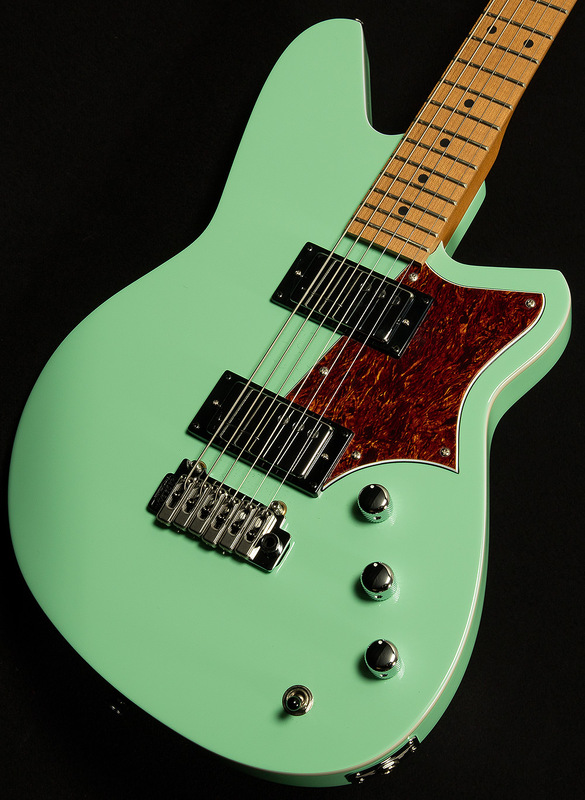 Enter the Reverend Descent RA, Reverend's attempt to make the wonderful world of baritone guitars accessible to all. The Descent W has a 26.75 inch scale-length, which is just an inch and a quarter longer than the standard Fender scale. Frankly, it feels so close to a regular guitar that it's easy to forget that you're playing a baritone! One might fear that such a short scale might lead to floppiness in the bass strings, but the custom set of 12-68 gauge strings that SIT Strings designed specifically for this guitar sound remarkably tight even though they feel slinky (and the 3rd string is even unwound, so you can still bend up a minor third if you work for it!). Speaking of tight bass, let's talk about the Railhammer Humcutter pickups and how well they work with the korina body. Both wood and wire work to keep everything sounding rich and full yet balanced. As their name implies, Railhammers have rails under the low strings for articulate bass response and poles underneath the treble strings for maximum girth. This unique pickup works wonders with korina's natural roundness and resonance. This is a baritone with the clarity of a non-baritone, and that is directly due to an inspired combination of tonewood and electronics. Reverend's famous bass contour knob is present on this guitar, too, and you can use it to find all sorts of inspiring timbres. For instance, I like to roll off the tone completely, then find the thinnest setting on the bass contour knob when I want to sound warm and dark while retaining clarity. Or, I'll put the tone on 10 and roll off the bass contour to get a spaghetti western-style, "tic-tac" bass sound. It's also really cool to play Sabbath-style riffs with both knobs on ten. The point is, the possibilities are limitless with the Reverend Descent W, and we hope you find the wide-open world of baritone guitars as inspiring as we do.